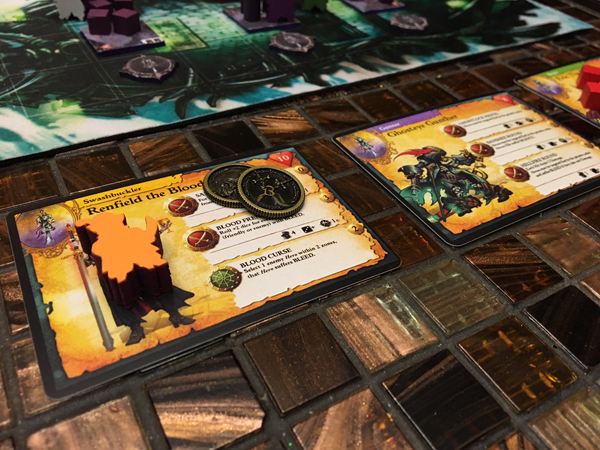 As we’ve come to expect from Cool Mini or Not, the components for Rum & Bones are of some of the highest quality in board gaming today. 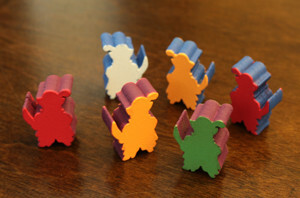 For a game pimper, there isn’t much one would need to do to pimp this game out besides painting the minis and making some upgrades to some of the cardboard tokens. 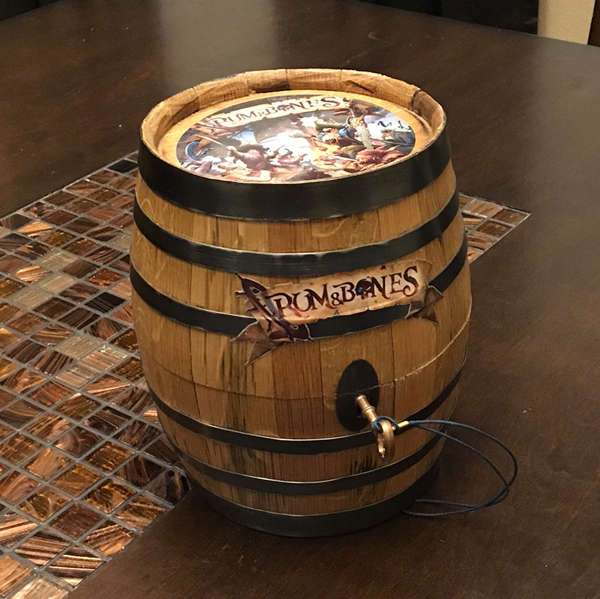 The guys at GMM Studios, a professional painting studio, proved me wrong by making an amazing custom Rum & Bones display for Gen Con 2015. 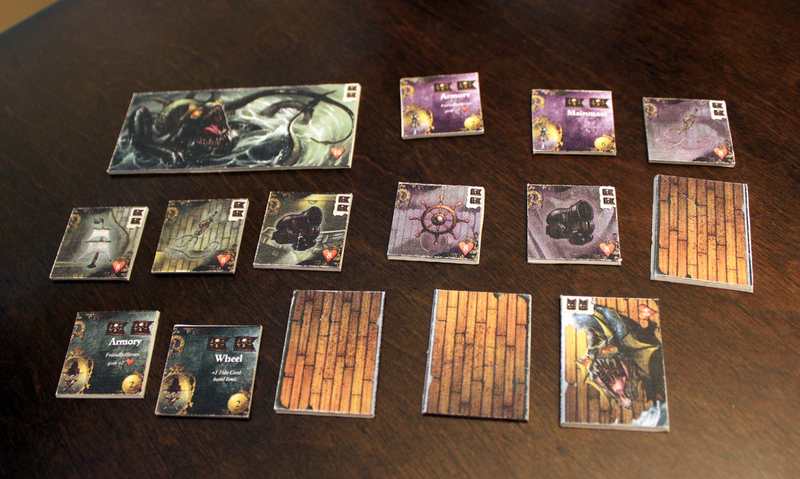 It is a full 1:1 scale 3D “board” for the game. The amount of detail and time they put into this playable display is amazing and you can read about it’s creation as well as see a ton more pictures in their announcement article. It is simply fantastic. 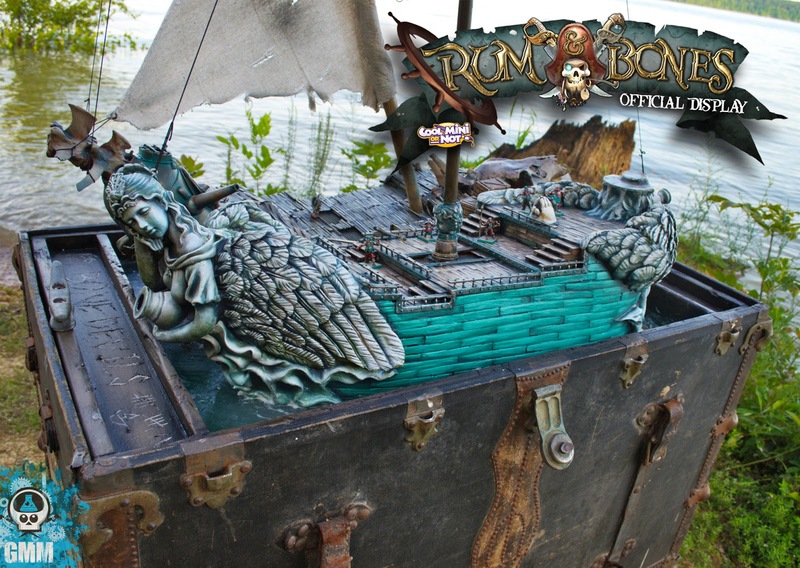 I did not have any intention of pimping out Rum & Bones and after seeing GMM Studios work, I knew the pinnacle to pimping this game had been achieved. 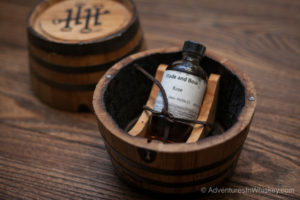 However, I have a friend who runs a great cocktail blog, Cocktail Hacker, and he received this great whiskey sample from Blade and Bow that included a split barrel case. My friend didn’t have a use for the case after he was done so he gave it to me to do something with. 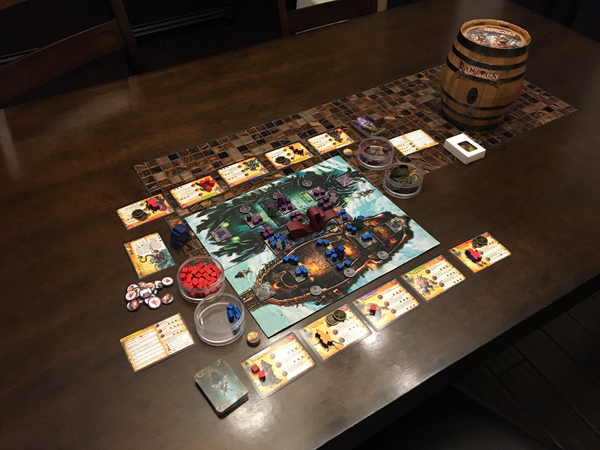 I kicked around a few ideas and then thought it would be a really fun case for Rum & Bones. As you can see though, that case is really small so it would likely only hold some of the tokens at best. 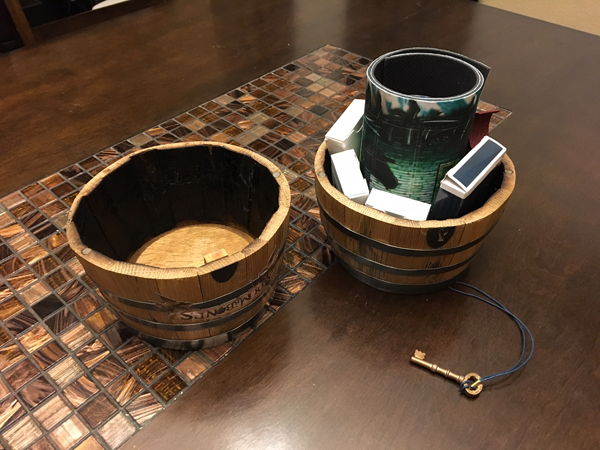 I didn’t want to use this great case as a simple bits bucket so I started thinking about how I might have it hold the entire game. Soon the entire project started to take shape. I knew I had to shrink the whole game and that would mean redoing everything from the ground up. Miniatures would be out as well to save space. As this has been a work-in-progress for quite some time, I’ve already talked about creating some of the components like the smaller tokens here. 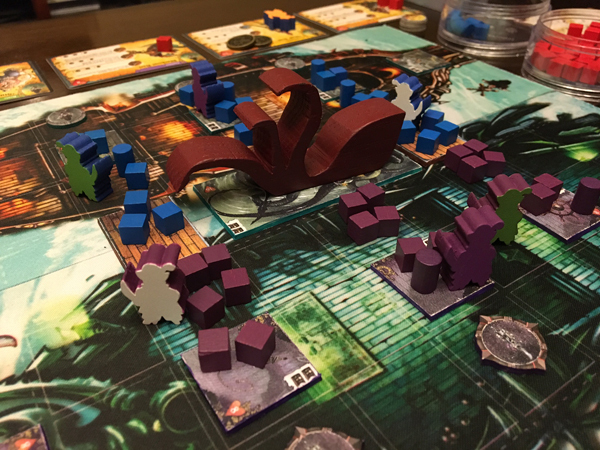 And while I wasn’t going to do miniatures, I didn’t want the game to be completely devoid of representative pieces so I pillaged some meeples from other games and created some new ones of my own, which I talk about in more depth here. I took images of the board and cards, shrunk them down, and used Print-On-Demand services like Artscow and Printerstudio. I sourced some cubes to represent the normal crew, damage tokens, and bosuns. Finally, I found some great screw-locking containers to hold everything in. The barrel itself was an actual whiskey barrel so it had all the char on the inside still. I sanded that out with steel wool, did some final cleaning, and then sealed the whole thing with a lot of acrylic gloss sealer. 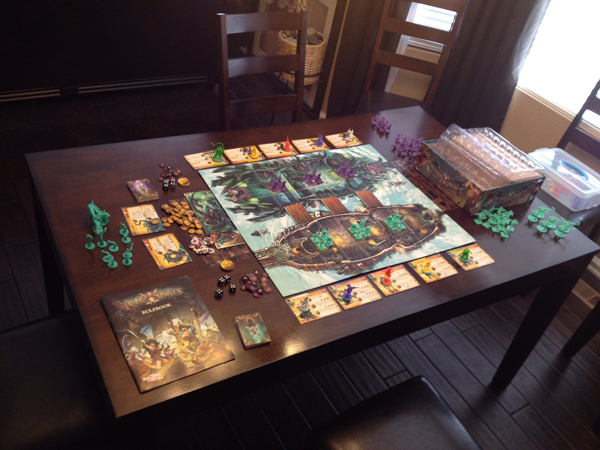 As you can see, the game now takes up substantially less room on the table. 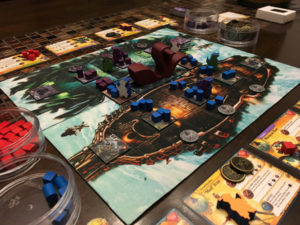 The pirate meeples from Minion’s Games Dead Men Tell No Tales work great and I picked up a set of Rum & Bones own pimped out metal coins for more flavor. All in all, this was a very fun project as I took a game already steeped in baroque decadence and miniaturized it to fit in a stylish yet awkward container without killing a lot of the overall charm and functionality that the original game is known for.